Theresa May’s counter-intuitive strategy — attacking the lawmakers she needs to approve her Brexit deal and showing up at a crunch summit without convincing answers as to what she will do if her accord is rejected — astonishingly paid off: EU leaders gave her an unconditional extension to April 12. While May got an extra two weeks to sort out a way forward, the dilemmas facing the country’s political class before yesterday’s summit haven’t gone away. Trade Talks | EU leaders will signal support for a request by European trade chief Cecilia Malmstrom to begin talks with the U.S. on cutting industrial tariffs. Germany is eager for the start of negotiations to avoid automotive levies that President Donald Trump has threatened. Eyes are on France for clues about how long it’ll keep dragging its feet on the negotiating mandate. Competition Revamp | EU leaders are also expected to mandate the next European Commission to recommend an overhaul of industrial rules, shielding the continent’s companies from unfair practices, such as state aid by third countries. While Emmanuel Macron and Angela Merkel didn’t get leaders to back their plea for big changes to the way mergers are handled, they got support for an “assertive industrial policy,” which they’ll discuss at their summit today. Euro-Area Health | The bloc’s leaders will also hear from ECB President Mario Draghi, who will debrief them on the state of the economy. His intervention comes as the results today of a survey of euro-area purchasing managers provide an initial glimpse of the region’s industrial and service-sector health at the end of the first quarter, a well-timed gauge in the aftermath of the ECB’s latest attempt to bolster growth. Vestager’s Campaign | EU Competition Chief Margrethe Vestager, who has pitched herself as a campaigner for fairness in taxation and business, put herself forward for one of the EU’s top jobs. While her centrist party group is unlikely to win elections, it may make gains that could help it haggle for one of several EU senior positions, especially amid growing calls for more women in top jobs. Slovak Outlier | Zuzana Caputova — an activist lawyer who advocates for gay rights and closer ties with the EU — is poised to become Slovakia’s first woman president, a poll showed, making the country an outlier in a region where euroskeptic nationalists have increased their influence. Clearing Rift | The ECB withdrew its request to gain more power over derivatives clearinghouses, exposing a rift among EU authorities over how to regulate the increasingly critical market. The central bank had pushed to gain “clear legal competence” in the area of central clearing, an issue that gained prominence after the Brexit vote as the U.K.’s departure means the bulk of euro-denominated derivatives will be cleared outside the bloc. Orban Spin | Hungarian Prime Minister Viktor Orban declared victory after Europe’s biggest political family suspended his party for eroding democratic standards, a bid to save face as he keeps open the options of repairing ties or joining like-minded populists after European Parliament elections in May. 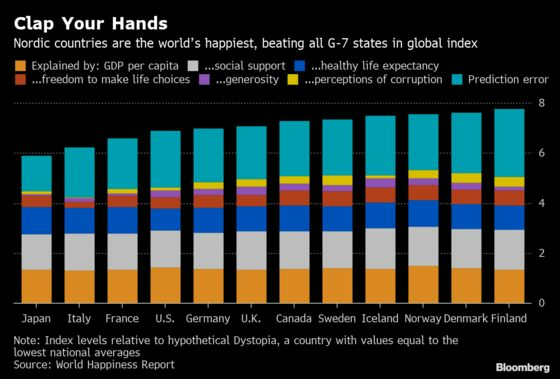 Finland topped a global happiness ranking for the second year in a row. It beat Nordic peers Denmark, Norway, Iceland and Sweden in a ranking of 156 countries by the United Nations Sustainable Development Solutions Network. Canada was the only Group of Seven member to make the top 10, despite losing ground from a year earlier along with the U.S., Germany and France. Final press conference expected at around 1 p.m.